Spend this summer lounging on Point Pleasant Beach. 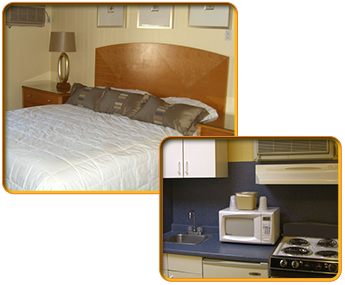 Based in New Jersey, The Amethyst Beach Motel is the perfect motel for you and your family. We have a number of large, clean, and comfortable rooms available, and offer a wide variety of amenities, including a property manager who is always there to help with any problems you may have. We have the accommodations you are looking for. Be prepared for your romantic weekend by reserving one of our rooms. Whether the room is on the ground floor or comes with a spectacular view, all of our double queen rooms have been newly decorated and are ready to be your home for the duration of your stay. When you want to upgrade your vacation, we have king rooms available. Make yourself at home in a room that has a kitchen. For families who want to spend time at the Jersey Shore, an efficiency is the perfect way to save money because you are able to prepare your own meals. Stretch your legs in our spacious rooms. Apartments and suites are available for weekly, monthly, and seasonal rentals. Our rentals come with daily maid service, as well as access to private patios, the heated pool, and private parking. 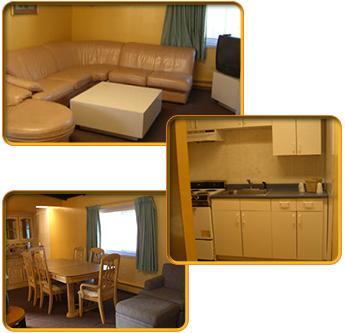 Our apartments are limited and very popular during the spring and summer. The suites are great for families and small groups. We have several one-bedroom and two-bedroom apartments available. These feature a full kitchen, a living room, and a dining room. For those of you who want a little more privacy on your vacation, we have a fully furnished beach house for rent. It has three bedrooms, two full bathrooms, and central air-conditioning. This newly renovated home is adjacent to our hotel and two blocks away from Jenkinson's Boardwalk and Beach.